I have been doing this liqueur for quite a few years now and it's probably my favourite wild flavoured drink. 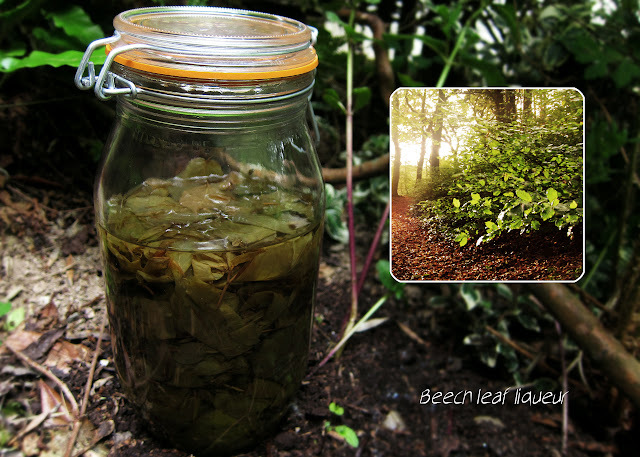 This is quite easy to make and involves steeping beech leaves in gin for a number of weeks. This old recipe is thought to originate from south-west England (recipe by Richard Mabey). It will be ready to drink when the liquid becomes a light green colour. Definitely worth a try if you like liqueurs, serve chilled from iced glasses. It kind of has a flavour that reminds me of freshly mowed lawns. Use young and fresh beech leaves that are stripped from their twigs. Half fill a large container with these leaves and then pour over the gin. Seal and leave for three weeks before straining the liquid off. Dissolve the sugar with the water and add the brandy. 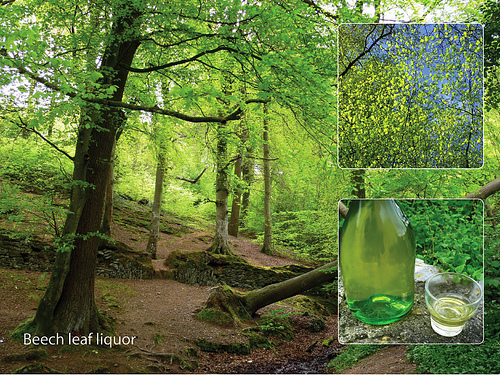 Add this to the beech leaf gin and bottle, this should produce almost 2 bottles of beech leaf liqueur.